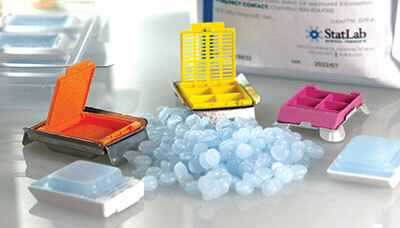 Tissue processing and embedding medium (paraffin) composed of light blue pellets. ParaPro™ Blue may be used with all tissues, but is ideal to use with small biopsy tissue specimens for better visualization of the tissue. Optimized for dermatology and urology specimens. A blend of highly refined paraffin with additives of synthetic polymers. Section down to 3µm thickness with excellent ribbon continuity; melting point 56°C. 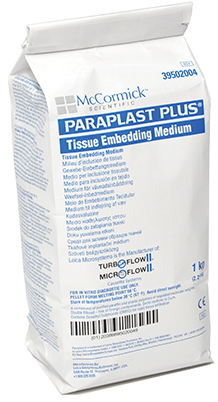 Tissue embedding medium for faster penetration. 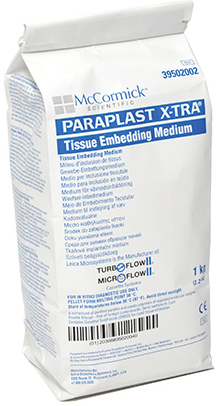 Paraplast Plus® is recommended for large tissues and tissues which are difficult to process. Section down to 2µm thickness with excellent ribbon continuity; melts rapidly at 56-67°C. Double filtered paraffin containing plastic polymers of regulated molecular weights and a small percent (0.8%) of dimethyl sulphoxide (DMSO) for more efficient infiltration of dense and difficult to process tissues. No stainable residue. Sold in cases of 8 bags, 1kg/bag. Optimum tissue embedding medium composed of clear pellets of low-molecular weight polymers and highly purified paraffin. A low viscosity paraffin. Low melting point of 52° to 54°C. Recommended for low temperature processing, small biopsy tissues and for general tissue embedding. Excellent sectioning qualities. Sections down to 2µm thickness with exceptional compression resistance and ribbon continuity. Cut sections are free of distortion; sample morphology is preserved. Low viscosity permits complete infiltration of dense tissue. Sections adhere perfectly to slides without leaving stainable residue. Sold in case of 8 bags, 1kg/bag. PolyShield® is a liquid paraffin repellent used as a protective coating on laboratory surfaces that are exposed to paraffin residue. PolyShield® can also be used to clean paraffin that has adhered to lab countertops and equipment. Histo-Clear, distilled essential oils (food grade) and Histo-Clear II, a mixture of aliphatic hydrocarbons and distilled essential oils, (food grade) are excellent non-toxic clearing agents replacing xylene. Histo-Clear is a Xylene substitute (a d-Limonene). The use of Histo-Clear in the laboratory means no longer having to breathe xylene when preparing histological sections. Distilled from oranges, carefully purified, and stabilized, Histo-Clear is one of the safest clearing agents available. Histo-Clear not only improves safety but also results. Histo-Clear leaves tissue less hard and brittle than xylene, facilitating the cutting of thin sections and prolonging microtome blade life. Nuclear morphology is rendered in fine detail. Histo-Clear enhances the clarity and vibrancy of acidophilic stains and improves staining of Harris' Hematoxylin with a brighter Eosin background. Histo-Clear can directly substitute for xylene and yields excellent results in automated tissue processing. The Histo-Clear II is a newer version of Histo-Clear, with less smell from the original Histo-Clear. Please read below descriptions. Please note that users must use a compatible mounting media. Histo-Clear II, like its predecessor Histo-Clear, is a safer histological clearing agent that leads to the production of high-quality tissue slides. Histo-Clear II is nontoxic and completely biodegradable, thus reducing disposal costs. 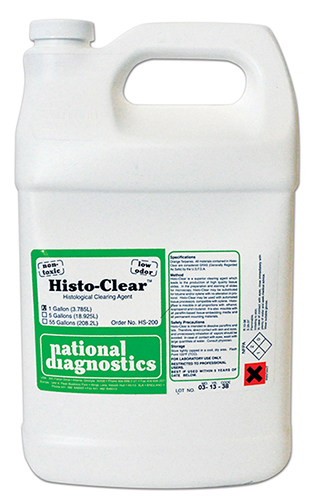 Histo-Clear II has a greatly reduced citrus odor compared to other citrus-based histological clearing agents. Note: Histo-Clear II is not compatible with many synthetic mounting media. Histo-Clear II is also a long-standing favorite in dry mounting procedures and aqueous mounting. Please confirm compatibility with your mounting media before using Histo-Clear II when wet-mounting with synthetic media.